Whether you eat this for breakfast or dessert, it's pure comfort. 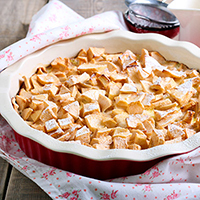 Pour into a greased 8- or 9-inch square or round baking dish. Bake at 350°F for about 60 minutes until set and golden brown on top. Serve warm with vanilla ice cream or whipped cream, if desired.